As we celebrate and remember the life of Luke Keefer, the word legacy has been used frequently. And while I think it is completely appropriate, I also think it would make Luke blush. Legacy is a loaded word. It is usually reserved for referring to the lasting impact of the famous, influential, or wealthy, and by the world’s standards Luke was none of those. Instead, Luke Keefer was a simple man. By calling Luke simple, I am not saying that he wasn’t an intellectual or that there weren’t many sides to him. I am saying that Luke Keefer was simple like God is simple. The simplicity of God is probably one of the least discussed, contemplated, and preached attributes of God. To affirm that God is simple is not to say that God is easily understood or contained. Rather, we are affirming our belief that God does not have parts. God would not be simple if he was 50% merciful and 50% righteous in judgment. Somehow, God is 100% both. While there were undoubtedly many aspects to Luke’s life, Luke was not one person some times and someone else at other times. In fact, he was one of the most consistent people I have ever known. There is something profoundly beautiful about this kind of simplicity. While this is not a typical theological affirmation, I think Dostoyevsky was right, and I am not alone. The idea that beauty will save the world was repeated by Alexandr Solzhenitsyn in his Nobel Prize lecture. It has also been included in official pronouncements of three different popes. As I write this we are approaching Holy Week. The beauty of God’s eternal simplicity comes into its sharpest focus and most vivid expression as we contemplate Christ on the cross. If we are not careful, our busyness can cause us to miss one of the few times of the year that is naturally conducive to wonder and awe. As Lent comes to a close, I pray that you take the time to consider Christ, that “self-giving” that was wrapped in a manger, the eternal “not-being for oneself” that got his feet dusty in order to reclaim what was his, that well of goodness that emptied out our worst pits of sin, self, fear, and death and transformed those holes into pools of love. Remember Christ, the beauty that inspires poets and musicians, the one who stirs the hearts of the persecuted to steadfastness, and the one who gave us the example of Luke. Remember and be thankful. 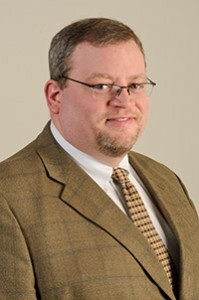 Dr. J. Robert Douglass is Associate Professor of Theology at Winebrenner Theological Seminary. Honoring the Life and Legacy of Dr. Luke Keefer Jr. will take place on Oct 2 and 3, 2015. Previous Previous post: Podcast: Who’s in your Space? Thank God for the cross. The wonderful cross. Simple in approach, yet profound in its meaning. God bless you this Holy Week.